Aisha Buhari is currently the wife of the Nigerian president Muhammadu Buhari. other quick facts such as her biography,family,daughter and some other facts about Nigeria's first lady that you probably never knew. Q: Aisha Buhari Quick Facts? 1. Aisha Buhari is the current first lady of the Federal Republic of Nigeria. She took over from President Goodluck Jonathan's wife Patience Jonathan on 29 May 2015. 2. 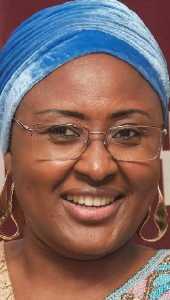 Aisha was born Aisha Halilu on 17th February 1971 in Adamawa State Northern Nigeria,she is the wife of incubent Nigerian president Muhammadu Buhari. Aisha's grandfather named Alhaji Muhammadu Ribadu was Nigeria's first minister of defence,she is from a family known for faming,Aisha's biological father was a civil engineer. 3. Aisha is a cosmetologist, beauty therapist and author by profession,she is also a Businesswoman. She married Muhammadu Buhari in 1988. 4. Aisha is a step mother to five other children from her husband late wife named Safinatu Yusuf,she also has five children namely Halima, Zarah, Yusuf, Aisha, Amina Buhari,Aisha currently resides in Aso Villa Abuja Nigeria. 5. Nigeria's first lady had her early primary and secondary education in Adamawa State,she later proceeded to attend the National Teachers Institute (NCE), ABU Zaria and the Nigerian Defence Academy (NDA), Kaduna where she bagged a bachelor of arts degree in public administration from Ahmadu Bello University (ABU),and a master's degree in international affairs and strategic studies from the Nigerian Defence Academy, Kaduna. 6. She is also a beautician and a cosmetologist,she obtained a diploma in beauty therapy from the Carlton Institute of Beauty Therapy, Windsor, United Kingdom. She also holds a post-graduate diploma in cosmetology and beauty from Academy Esthetique Beauty Institute of France. The Nigerian first lady is also a member of the United Kingdom Vocational Training and Charitable Trust and the International Health and Beauty Council. 7. As a business woman she managed her own beauty salon and spa named Hanzy Spa where she was the managing director (MD),she immediately closed down her beauty salon when her husband became the president of Nigeria . 8. The Nigerian first lady is also a writer as she earlier published a book titled ''Essentials of Beauty Therapy,A Complete Guide for Beauty Specialists'',her book was recommended as a text for the NBTE curriculum. 9. Aisha is known for beng vocal,she has severely criticised her hushands administration and his political party known as the APC,in October 2016, she said that she would not support her husband's bid for the next election,her husband responded by saying that she belongs to his rooms. 10. There was a report that Aisha Buhari was spotted with a bag worth between $69,000 and $89,000 which is approximately over N40 million Naira. Q: Aisha Buhari Current Net Worth? Aisha Buhari is estimated to have a current net worth of $10 Million Dollars.